Poetry is grossly undervalued today, and even dedicated readers sometimes overlook the disproportionate excellence of 20th‐ and 21st-century poetry from the Scottish isles: a strange confluence of self-defeating injustices. I believe this is the first poetry anthology of its kind — that is, one with a remit wide enough to bring in writing from any Scottish island, but distinct enough not to include Highland or other mainland work. 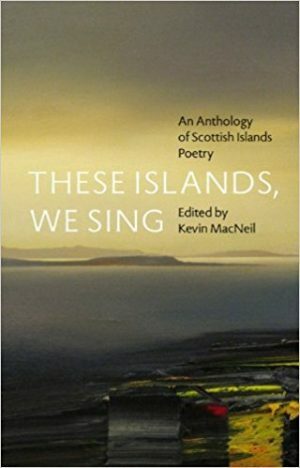 That this was the first anthology with such a remit was faintly embarrassing, while it strengthened my assertion that poetry from the Scottish islands is generally and unfairly neglected. Thus the islander is seen as the pawky ferryman whom one meets at the entrance to the enchanted land of summer, when the country to which he belongs is beautiful and slightly hazy, a place for a holiday. After this interlude, the real world with its constant grind and envy and ambition is waiting for us, but it is nice to think that the islanders exist behind and beyond it, as a haven beyond the sharp rocks which await us. Many and varied types of otherness are foisted upon islanders; these can provide material for poetry, yes, but they can also be deeply counter-productive. Thus, the poet is fighting external pressures, assumptions, stereotypes, even before she has begun to put ink on paper. Smith criticises the narrow, patronising portrayals of islanders one encounters in books such as Whisky Galore and the novels of Lillian Beckwith — simple, comical characters who speak a language no islander has ever spoken. By a process of insidious osmosis, these publications, bolstered by external perceptions of them, seep into the islander’s consciousness as reminders of who we are (but never really were), and of who we are seen to be — and the boundaries dissolve with an injustice that is tacit, invisible and lasting. The choices for the gifted islanders are more poignant and frequent than they would be in a more settled land, for each choice appears to involve allegiance or disloyalty. The problem goes deeper still. For you can write poems of the utmost integrity — true to your heart, your mind, your worldview, your craft, your experience — but they might nonetheless be considered disloyal by a parochial reader, one who willfully or otherwise misinterprets the poem (and, likely, in an insular Scotland, misinterprets the poet). The Hebridean poet must often withstand assumptions relating to poetry, the poet’s own poetry, and the poet him‐ or herself. The general characteristics of Gaelic Hebridean poetry are summarized by Ronald Black in the introduction to his anthology An Tuil: Anthology of Twentieth Century Gaelic Verse (Birlinn, 1999). Traditional (Gaelic) poetry is typified by rhyme, melody, ‘occasional intellectual inconsistency’, wordiness, an audience that is primarily local. Modern poetry tends towards free verse, dissemination via print (or online), ‘some artistic snobbery’, ‘tight logic or no logic at all’, a target audience of ‘anyone’. The traditional bard often lived ‘at home’ (poets self-evidently live at home — Black is using ‘home’ in the islander’s sense of true/original/lasting — that is, island — home); the bard had little experience of higher education and was often non-literate (never illiterate). By contrast, the contemporary poet is ‘seldom living at home’, is university-educated, literate in Gaelic, and has excellent English. The latter description certainly applies to many of the newer Hebridean poets, such as Babs NicGriogair and Pàdraig MacAoidh. Innovations in writing form and technique do not come about easily — and it is important here to acknowledge that the islands are quietly renowned for their small-c conservatism, with its attendant benefits and disadvantages. I envy […] those poets who have developed in a stable society, who can start from there and are not constantly analyzing the very bases of their art. Smith is partly referring here to what is sometimes called ‘the paralysis of analysis’ — a sense of stasis that settles troublingly over one’s efforts, replacing dynamism with doubt, a fatalistic and unwanted compulsion to go back to first principles every time one attempts to write. This is substantially the human, true-life result of the ‘othering’ of island culture, and of the ‘marginalising’ and the ‘silencing’ that I refer to in These Islands, We Sing. These problems are real. When one adds to them a natural concern over how the writing will be perceived by the local community — family, friends, neighbours — perhaps the wonder is that Hebridean poets exist at all. They do so in frustratingly small numbers — especially when one considers how gratifyingly many talented poets there are living and writing in, say, Shetland. I wonder if there isn’t something inveterately skillful, if not wholly dishonourable, in the ability to faze, or freeze, out one’s own intellectual heritage — in order to blend in with the opinions, and the values placed upon the opinions, of someone else. If there is, I’d say the native Gael probably has it down to a fine art. The ‘I kent his faither’ syndrome which so long plagued the arts and airts of mainland Scots and Scotland for decades, if not centuries, has had its equivalent in the ‘offshore islands’ in the form of ‘Who do they think they are?’ Always a difficult question. Who indeed. Plus ça change. The difficult points Iain Crichton Smith raised in his essay in 1982 are still very much with us. Who, then, are the exceptions, the Hebridean poets who overcome the internal and external obstacles and find their way to publication? Aonghas ‘Dubh’ MacNeacail, Aonghas Pàdraig Caimbeul, Rody Gorman, Anna Frater, Maoilios Caimbeul, Dòmhnall S. Moireach, and Babs NicGriogair are among the writers who explore these problems against the vast theme of diaspora in a bilingual collection of essays and commissioned poems called Struileag: Cladach gu Cladach/Struileag: Shore to Shore. Most of these names, of course, are familiar — writers whose voices are distinctive, whose contribution is assured. The poets in the Struileag anthology must negotiate their relationship with tradition and innovation (‘make it new’), local issues and global interdependence, history and, to one extent or another, autobiography. The poems are diverse — encompassing secular psalms, raps and that all-too-rare Japanese form incorporating prose and haiku, the haibun. The result is a refreshing mix of the familiar and the provocative; an accompanying CD, which sets the poems to music (folk, rap, etc) has a similar atmosphere of passion, edginess and innovation. This level of self-awareness, and accompanying sense of portable rootedness, is not uncommon among contemporary Hebridean poets. Pàdraig MacAoidh, originally from Lewis, now lectures at the University of St Andrews. He has written a fine (and non-hagiographical) academic book on the work of Sorley Maclean (Sorley Maclean, AHRC 2010), a pamphlet From Another Island (Clutag Press, 2010) and a full collection Gu Leòr (Acair, 2015). His is one of the most lively and informed of voices in the world of contemporary Hebridean poetry. MacAoidh has recently co-edited, along with the multilingual Canadian Gael, poet Iain S. Mac a’ Phearsain, an anthology of transgressive Gaelic poetry (An Leabhar Liath: 500 Years of Gaelic Love and Transgressive Verse, Luath 2016). Transgressive, yes — and progressive, too. Arguably the most impressive recent breakthrough in Hebridean poetry is the publication in 2014 of Niall Campbell’s Moontide (Bloodaxe Books). A Poetry Book Society recommendation, Moontide is a (monolingual, English) collection that genuinely marked the emergence of a major poetic talent. The book — rich with Hebridean tropes and an emotional profundity — is exceptional not only in its high-calibre poetry but in that it has achieved the recognition it deserves. Campbell (an Uibhisteach, or Uist man, now resident in Leeds) has been awarded an Eric Gregory Award, a Robert Louis Stevenson Fellowship, the Edwin Morgan Poetry Prize and the Saltire First Book of the Year Award. It is not just that Niall Campbell demonstrates great potential, but that he is actively fulfilling his promise — which is gladdening and encouraging to witness. In These Islands, We Sing I ventured to make a few predictions about the future of Hebridean writing. I imagined we would see poets writing more works of prose (as has happened — for example, recent non-fiction works have appeared from Dòmhnall S. Moireach, Ian Stephen, Maoilios Caimbeul). Regrettably, we have not seen an upswing in the publication of novels by Hebrideans (but that’s another essay in itself). Performance poetry has grown exponentially in popularity within Scotland over the last few years, and Hebridean performance poets are emerging — see, for example, Kirsty Nicolson’s poem about Multiple Sclerosis, as featured on the BBC’s website. I don’t have space to discuss, or even name, all the Hebridean poets who are publishing occasionally in magazines, though I have high hopes for the likes of Karin Slater and for the as yet unknown Niall Campbells of tomorrow. The current state of Hebridean poetry, then, is cause for guarded dismay and open joy. Dismay because old problems are proving more deeply entrenched than would be desirable, joy because there are poets achieving success despite these. In Douglas Dunn’s words, ‘poetry’s cost is always exorbitant’; maybe, then, the best poets are inevitable. I’d like to finish by celebrating the work of a brilliant and under-appreciated poet who died in March of this year, aged eighty-six. Donald MacAulay has always been revered by those who appreciate his work. Iain Crichton Smith called MacAulay ‘an exceptionally sensitive and complicated man’ (one might use the same words to describe ICS himself). Unlike Smith, MacAulay was not a prolific writer. He wrote a careful, measured poetry that had, and has, lasting depth. One of MacAulay’s final poems appears in the debut edition of Tuath, alongside an admiring salute from Rody Gorman. one of the heroes of our time. Donald MacAulay’s work is long overdue a full appraisal. MacAulay was not an unsung hero — he sang and was sung, but was, is, heard by too few. Kevin MacNeil is a novelist, poet, screenwriter, editor and playwright from the Outer Hebrides. He is the author of books such as The Brilliant & Forever and The Diary of Archie the Alpaca, and editor of Robert Louis Stevenson: An Anthology (Selected by JL Borges and A Bioy Casares) and These Islands, We Sing. MacNeil has won numerous awards and currently lectures in creative writing at the University of Stirling.